I was a big fan of Lara Croft and the Guardian of Light when it came to consoles and, it turns out, I'm just as big a fan of the iPhone version. The game translates surprisingly well, using twin digital thumbsticks to let players control Croft's movements and in which direction she fires her twin handguns. You can also tap over to a spear, which can be thrown into walls and then jumped up on to get to hard to reach spots. Croft also has a mine she can drop and later detonate. The game comes with ten levels, a plethora of challenges and the ability to play through the game cooperatively with a friend. The game is worth the $6.99 price tag despite the issues I had finding anyone to play the game with. Lara Croft Shows Off The "World's Largest iPhone"
Lara Croft's face adorns the 56 iPads that make up the "world's largest iPhone" at London's St. Pancras International station. 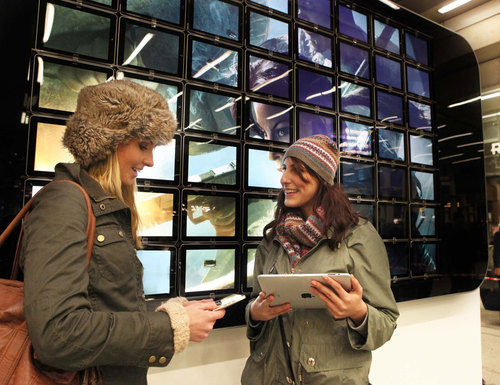 Once the installation was completed the devices were given away to celebrate the iPad release of Lara Croft and the Guardian of Light. 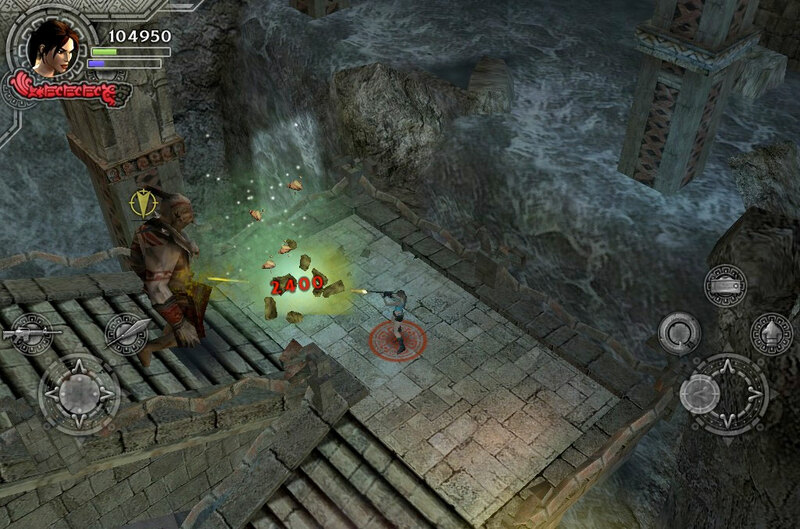 Square Enix is bringing Tomb Raider spin-off Lara Croft and the Guardian of Light to iPhones, iPods and iPads this week. It's the kind of Tomb Raider game that might play just fine with a touchscreen. The top-down cooperative adventure has already been released on PC, Xbox 360 and PlayStation 3 as a downloadable game, but the newest Lara Croft game—pre-reboot—will discover new platforms tomorrow. 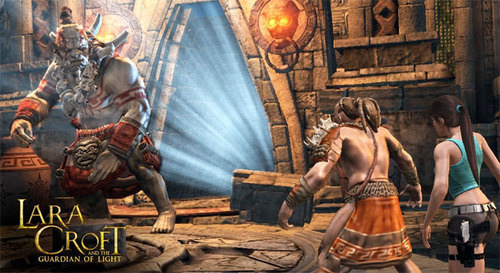 The iPhone/iPod touch version will set players back $6.99 USD, with an HD version of Lara Croft and the Guardian of Light shipping as well for $9.99 USD. We'll see if touching Lara Croft to control her (and her Guardian of Light partner Totec) when the game hits on December 16. Are career criminals Kane and Lynch finally going to appear in a great game? It would appear so, as the PC version of Tomb Raider spin-off Lara Croft and the Guardian of Light is getting some unexpected playable characters. The stars of IO Interactive's gritty but flawed Kane & Lynch series of action games will be coming to adventure-puzzler Lara Croft and the Guardian of Light, a surprising addition seemingly confirmed by developer Crystal Dynamics. Messrs. Kane and Lynch will be joined by another pair of well-known video game characters, Kain and Raziel from the currently dormant Legacy of Kain series. YouTube user MrNightmareTM, via NeoGAF, has already uncovered the four downloadable characters by hacking the PC version of Lara Croft and the Guardian of Light, which you can see in a pair of videos. Crystal Dynamics wants to know who you want to see made available first. Out of curiosity's sake, I have to go with Kane and Lynch. The newest Tomb Raider game will get a major feature update next week, when developer Crystal Dynamics adds online multiplayer support for Lara Croft And The Guardian Of Light. There's just one little catch. The online co-op patch for Lara's downloadable game is only coming to the Xbox 360 version next week, on October 27. The same update for the other versions of Guardian of Light released on PlayStation 3 and PC will be "coming later," according to the developer. Crystal Dynamics told Kotaku last month that it didn't want to ship its online cooperative component with a "sub-par experience" when explaining the delay for the long-promised feature. Lara Croft And The Guardian Of Light owners will receive the first of the game's downloadable add-on packs for free in penance. The news today that the PlayStation 3 and Steam/PC versions of Lara Croft and the Guardian of Light will be out next week confirmed that online co-op won't be available at launch, just as it wasn't on the Xbox 360. "We didn't want to deliver the subpar experience online," Karl Stewart, global brand director at Lara Croft development studio Crystal Dynamics told Kotaku during a phone interview today. He said that the online co-op will be added to the PS3 and PC versions "as soon as possible," but as with the 360 version, Crystal Dynamics' developers recognized late in development that the feature wouldn't be good enough for launch. 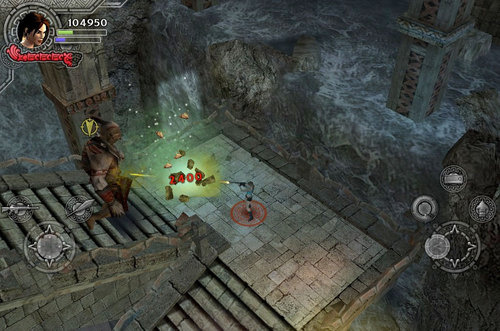 Lara Croft and the Guardian of Light is a well-received top-down two-character twist to the traditional Tomb Raider style of games. It was designed to be played co-op and was promoted until nearly the eve of its Xbox 360 release as supporting both offline and online co-op. But prior to that August release, the game's creators said that online co-op would be delayed. Online co-op for the 360 version is now slated for release at the end of September alongside the first of five planned packs of downloadable content. The first of those packs will be free for Xbox 360 users for the first 30 days of release. It will include a trio of new challenge rooms. Stewart said that Crystal Dynamics hopes to be able to offer the same kind of release for the PS3 and Steam versions but that such a plan is not set in stone yet. Online co-op is not in every game, but it is surprising to see it bedeviling a studio, particularly one as experienced as Crystal Dynamics. "This is our first time doing online co-op using our engine in the studio," Stewart said. "We were open that it would have the challenges... Whether it be lag, the ability to drop in and out or the ability for the leaderboard to update as you played, these are things that needed to [work.]" Stewart said that online play is not being held back for any business reasons, it's simply a matter of polish and taking care of it at these late parts of the game's development cycle on the various platforms. "We're committed to online co-op," he said, saying there's no chance of the feature being dropped. "We're playing [the game] internally online. It is working and it is working well. We need to make sure we got that right." He said that the studio wants to get online co-op added to the PS3 and PC versions as soon as possible, allowing for the possibility that Lara Croft gamers on those platforms won't have to wait as long as 360 owners have been for the feature.